The most abhorrent occupation in the world? Imagine you have a business. You’re not breaking any laws and its something your family have been doing for hundreds of years. Your whole community has been doing it and whole cultures, traditions, music, stories and clothes have evolve around it. Industries have thrived on your products. Your product is gluten free, contains no additives, has a low carbon cost, doesn’t involve ploughing and transforming the land and gives us beautiful food that kings and commoners alike adore. Your industry is one where workers can do well just by dint of tenacity and hard work. The aristrocracy and powerbrokers don’t go near it. Your activity is the source of identity for coastal communities. At work you are free. Now imagine, having been bombarded with insultingly simplistic hyperbole about the impacts of your industry, that the middle classes decide not to like you. They view your job as one for greedy, good for nothing skivers, folk that take something for nothing. These people are more articulate than you, better off, better connected, more numerous and have no economic link to your business. If you fail it has no impact on them. In fact, they earn more money the more despicable they can make you appear. Casting aspersions on your character and industry is a multi-million pound business. Not only that but their success in vilifying you makes them feel smug. These people make such a good job of making you look bad because that is what they are paid to do, they can afford good lawyers and bad politicians. You, on the other hand, are paid to work. Not to wear a suit and sit in an office wearing a shirt and tie in meeting after meeting, discussing the nuances of situations over canapes. You find yourself and your industry being eroded. Not by fact-based evidence but by the wild ramblings of people who are ideologically driven to persecute those that make a living from a common resource. If this is you my friend, you are a fisherman. Be proud. Be strong. Be safe. Dr Magnus Johnson is a lecturer in Environmental Marine Science at the Centre for Environmental and Marine Sciences, University of Hull. His views are his own. Indigenous peoples are generally regarded with distaste in their homelands. Consider for example how the average UK citizen views gypsies, how Indonesians view the Bajo, the mistreatment of the Inuit in North America and the shoddy treatment of Aboriginies by Australians. Much of this is likely to do with the chasm that there is between the way in which goods are valued. Indigenous peoples, often living in small groups, survive on reciprocity and social responsibility, a value system often oiled by their close family ties. Conservationsists love the word SCIENCE. Brockington and Igoe point out that generally organisations claim this word when they are striving to acquire power and prestige and to suppress opposition. The public find it hard to question “scientific facts” and a variety of techniques are employed by conservation organisations – selective choice of facts to use, using irrelevant but impressive sounding facts and ignoring inconvenient truths. 5) when you retire you leave with a broken body and a boat that is worth less than when you started. Fishing has been perhaps one on the last occupations where you can succeed purely by dint of hard work and tenacity. Recently we have seen the high profile application of pseudo-science to the world of fisheries by a cook. Would you ask a fisherman how to chop vegetables? Hugh Fearnley Whittingstall is making enormous amounts of money out of his public haranguing of the fishing industry (Fishfight isn’t a charity by the way). With his initial campaign against discards I just felt a mild irritation that someone who chops vegetables and heats meat was able to get further than many many marine scientists who have wrestled with the problem of discards for years. More recently however he has jumped on the Marine “Conservation” Zone bandwagon. Something that rich propaganda organisations such as Conservation International and Greenpeace are only too happy to support. I recommend listening to Ray Hilborn for a bit of balance in the face of this well financed barrage of mis-information. Excluding fisherfolk from areas that they have fished for generations in order to salve the consciences of middle class, sandle-shod, cord-wearing intellectual hippies is not the answer. 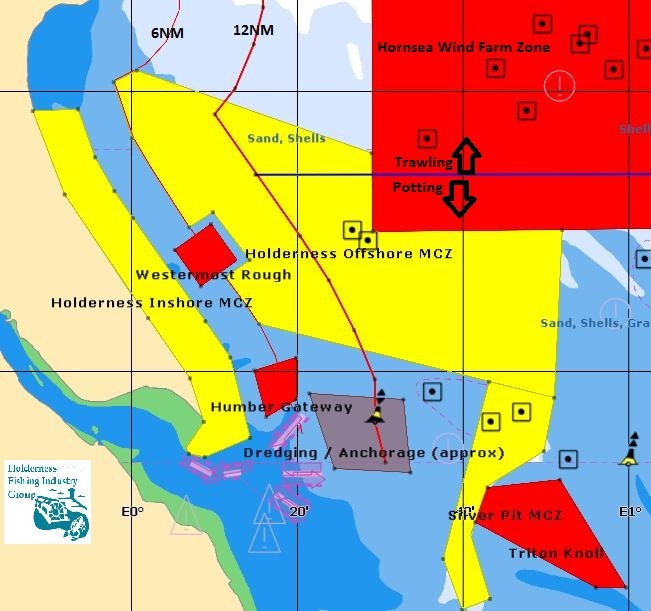 Look at the chart here (provided by Mike Cohen of Holderness Fishing Industry Group) and look at how much area could be off limits to fishermen. This area will be fished harder and unsustainably as the fishing industry is more and more squeezed. There is no evidence of any sort of spillover effect likely to occur in this region. Note how MCZs work around the requirements of the Energy Industry (new kids on the block) but not the unfashionable fish folk. Fisherfolk are likely to be the new conservation refugees and if the extremists get their way there will be further marginalisation, job losses and poverty in rural coastal towns and villages in the UK. The pretty ones will be sources of 2nd homes to the middle classes escaping from the city – packed in summer, tumbleweed and closed shops in the winter. The ugly ones will be left to rot. Although my ancestors were fishermen and whalers, I am not blindly pro-fishing and I am not anti-conservationist. I’m just anti-stupidity. Dr Magnus Johnson is a Marine Biologist at the Centre for Environmental and Marine Sciences. His views are his own.